My FIRST car? The first I actually owned or my first love? My first love would be the 1962 red with black convertible top Chevrolet Corvair! She was a beaut! The heaters in the floor of the back seat kept me warm as my oldest brother, Rick, drove from Drayton Plains to Kalkaska with me in the back seat! We hadn't had the car a month when one day my father backed her out of the two stall garage, on his way to “tool around and show her off”. I felt an urge to be on the other side of the driveway and ran behind him, falling. With arms outstretched, my six year old body skittered across part of the cement driveway. Without realizing I had fallen, my father continued to back out of the garage. He realized he had run over something when the car heaved somewhat over my arm. I’m pretty certain I squealed at this point. Braking immediately, I was drug out from under the car and rushed to the doctor’s office. (We lived next door to our doctor, so he normally would see us right away) Nothing broken, but the skin and my father’s nerves. I have a nice scar where the tire pinched the skin, I think when he jammed on the brakes. After that incident, on nice days, he would back her out of the garage with the top down and just park her in the drive. Every neighbor kid that could fit, jumped into the car. My older sister, Holly, would “drive”. Using our imaginations, we journeyed all over the world! Our favorite car trip was to Africa to see lions, elephants, giraffes, as well as the cheetah’s that would travel with us on the hood. Sometimes we would go tropical with snakes and alligators, or to the mountains to see goats and snow leopards. We even saw Cleopatra and the pyramids! That little three speed manual transmission taught many of us how to shift! I could power shift without the engine turning over once! For safeties sake, today’s kids don’t have that luxury. They can’t hop into a car to avoid a charging rhino or the swoop jaws of a Tyrannosaurus Rex. My first car love; helped shape my imagination, gave me lessons in safety and kept the neighborhood kids from running the streets for hours at a time. 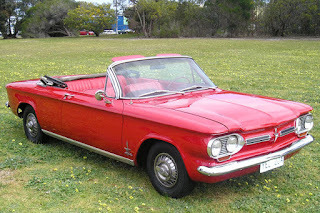 My first car love was a 1962 red and black convertible Corvair. That was one sweet ride! You were so lucky you weren't hurt worse than you were. I really enjoyed reading about your first car love. So cool how you and the kids took imaginary trips to far away places behind the wheel. You always tell the best stories! OMG...I had a white one, but I was an adult and I drove the heck out of that wonderful little car. I also had a brown '63 and a red '66 but the white '62 was my first and favorite car. It was so cute and so much fun to drive. I knew we had a lot in common, but who knew this one? Your poor dad! Yes, I suppose I should feel worse for six-year-old you with the run-over arm, but the arm was fine. I'll bet a little piece of your dad never quite got over that, though!